Firefighters from Osage County Fire District No. 2 returned to the scene of a residential fire at 4 Lord Street in Osage City Wednesday afternoon. Clarence Adkins, the occupant of the house, discovered electrical breakers tripping, followed by smoke inside the house. 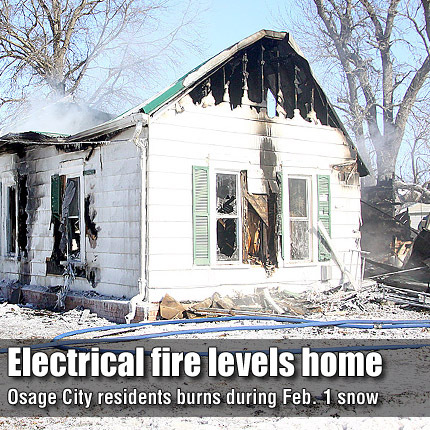 Firefighters from Osage City, with mutual aid from Burlingame and Lyndon, were called to the scene at 7:31 p.m. Feb. 1. All of the family and pets were safely removed from the house, which was a total loss and continued to smolder the next day. The family is staying with friends in Osage City.